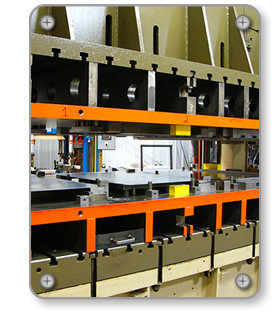 From prototype to final product, New Bremen Machine & Tool can meet your needs. Read about our Quality Capabilities. All the following presses have a complete feed line, with up to 10,000 lbs. capacity and can handle material widths up to 36 inches. Bliss 800 ton 60" x 108" bed shut height 33" Max 23" Min. stroke 14"
Bliss 350 Ton 60" x 108" shut height-min. 11.5"/max. 35.75"
Clearing 300 Ton S2-300-108-54 shut height-min. 17"/max. 29"
Clearing 250 Ton L-R 1-', F-B 4' shut height-min. 15"/max. 33.5"
Bliss 200 Ton w/Air Cushion 71" x 38.5" shut height-min.10"/max. 15"
Komatsu 200 Ton 44" x 72" shut height-min. 13.75"/max. 17.75"